We have had a very enjoyable week in Reception. We have been learning Spring songs, taking part in an Easter egg hunt around the playground, creating patterns on Easter eggs, making chocolate nests and taking part in our Easter bonnet parades. Thank you so much to all our parents who helped us make our beautiful bonnets- we all looked amazing. We wish you all a very happy and restful holiday. On Wednesday 23rd March eight children represented Chilcote at a Year 5 and 6 swimming gala at King Edwards Camp Hill pool. The children swam two individual events out of front crawl, back stroke, breast stroke and freestyle. They also swam a team medley relay with the same strokes in it. The boys and girls faced separately. Chilcote finished the competition having won 6 out of 18 races, coming second in 7 races, third in 3 races and fourth in 2 races. They finished second in both relays. With all the results in it meant that Chilcote had finished in second place overall, which is a fantastic achievement. As always the children represented the school brilliantly and they performed fantastically well. Well done to all involved!!! On Wednesday afternoon the hall was a riot of colour and creativity as Year 1 and Year 2 took part in their Easter Bonnet Parade. It was clearly obvious that a lot of hard work and many hours of cutting and sticking had taken place as the children's hats were fantastic. Mrs Doherty had the very difficult task of choosing a winner from each class. Well done to all of you! On Tuesday morning Year 1 performed their Easter Assembly for their parents. They were fantastic! There was lots of great acting, wonderful dancing and most of all brilliant singing. Well done to everyone in 1 Elm and 1 Fir, we are very proud of you. Thank you to the parents for coming to watch. On Friday 18th March we had a fantastic day for Sport Relief. Everyone came to school dressed in their sports kit and took part in some exciting sports activities. We also enjoyed our special Sport Relief dinner of Hot dogs, curly fries and donuts! This gave us lots of energy! We raised £410.52 for Sport Relief. Well done everybody and a big thank you to everyone who brought in a contribution! The House Captains and Vice Captains. On Friday 18th march chilcote's boys football team played against acocks green in their third league game. The game was played at yardley wood playing fields. The game started well for Chilcote with the boys having plenty of chances but, as has been the case on a few occasions this season, they just could not take them. Fortunately things changed when Damian put Chilcote 1v0 up. By half time it was 5v0 with Damian having grabbed a hattrick and Tom and Oliver scoring the other two. In the second half Chilcote continued to dominate. The boys played some of the best football they had played all season. Damian scored a further two goals, Tom scored again and so did Robert and Dawud. The game ended 10v0 to Chilcote. Well done to all of the boys it was a magnificent performance and despite dominating they still acted with dignity and humbleness!!! We had an enjoyable (if rather chilly!) time outside taking part in Sports activities led by Year 6. We all had a go at scoring goals in a penalty shoot out, then we tried out the obstacle course, followed by throwing bean bags into hoops and playing a cooperative catching game. Thank you to Year 6 for planning, leading and helping us with the activities. On Thursday 17th March seven children from Chilcote (Roberta, Emily, Leah, Ailish, Robert, Dawud and Sam) represented the school in a netball tournament at Kings Norton Girls' School. The tournament was played in a round-robin format, with Chilcote playing a total of eight matches. They started off against Cotteridge School and lost 1v0 in a tight game. Then, they played against Broadmeadow B team and won 4v0. They won their next game too 1v0 against The Oaks. Next, they played and beat Yardley Wood 3v0, and also they beat St Joseph's school 7v0. In the following game they beat Hollywood 1v0. After this, they beat Bells Farm 3v0. Finally they beat Broadmeadow A team 2v0. Therefore, Chilcote won seven of their eight matches, which was an incredible achievement. With all of the results in Chilcote finished in second place, courtesy of the fact that Cotteridge did not lose a game. All of the children played really well and represented the school fantastically well. Well done to all involved, another fantastic sporting result for Chilcote!!! On Wednesday morning Year 1 joined four other skills to take part in a Multi Skills Tournament. It was a great morning. The children took part in a variety of different activities which included tennis, football, rugby, throwing and catching related activities. Everyone tried very hard at each of the different activity stations. We all had a great time, but were quite tired by the time we returned to school. On Monday 14th March Year 2 went to Billesley Tennis Centre to take part in a multi-skills festival. The children were in teams of 10 and participated in a a range of activities including penalty shoot out, parachute games, bowling at wickets and relay races. Everyone had a fantastic time and tried their best! Well done Year 2! 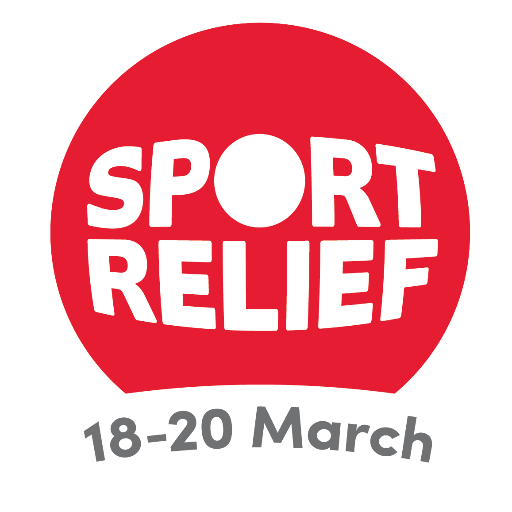 On Friday 18th March Chilcote Primary will be raising money for Sport Relief. Each class from Nursery to Year 6 will get the chance to take part in some really fun sports activities, including dodgeball, a penalty shoot out against a House Captain or Vice Captain and an exciting obstacle course. We are encouraging children to bring in a £1 donation for taking part. We will let you know how it goes! On Friday 11th March eight girls from Year 4 and 5 represented Chilcote in a girls' 7-aside competition held at Yardley Wood playing fields. The competition was a round robin meaning the girls played all the other teams once. They were competing against five other schools. The girls won their first match 2v0. Then they drew their next two games 0v0 failing to take the chances that they created in front of goal. Unfortunately, the girls lost their next game 1v0 against a very good St. Bernards team. Finally, the girls won their last game 2v1 against Hollywood. With all of the results in it meant that Chilcote finished in second place in the tournament. Well done to all of the girls who played really well and represented the school superbly!!! On Friday 11th March eighteen children from Chilcote represented the school in a mixed sportshall athletics final. They were competing against all the other winners from around Birmingham (the Chilcote team had won the Baverstock tournament earlier this year). The competition from the other schools was very high and it was an excellent tournament. All of the children from Chilcote did their best and performed brilliantly in all of their individual and team events. The children of Chilcote competed against ten other schools on the day and when all of the results were in they finished in eighth place overall with a total of 278 points. Well done to all of the children involved. Everybody represented the school outstandingly well!!! On Monday 7th March we were all very excited in Reception as 10 eggs were delivered in an incubator, ready to hatch on Tuesday or Wednesday. On Tuesday we heard cheeping from inside the eggs but none of them hatched. On Wednesday we arrived in school to find a sleepy chick and another egg cracking. We were delighted to see it hatch during the afternoon! On Thursday morning we found that 5 more had hatched in the night- so we missed the exciting moments! We kept a diary each day to monitor the events and were very careful when we observed the chicks so as not to frighten them. Sadly, 3 eggs did not hatch out, but the 7 chicks are doing very well. Mrs Thomas took them home for the weekend and her family enjoyed caring for them and watching them grow- they were growing feathers by Sunday afternoon! They will be collected by the farmer and returned to their farm. On Friday 4th March, some of year 6 visited Kimichi music school in Acocks Green to participate in an interactive workshop to demonstrate woodwind instruments. They were accompanied by Mr Cross and Mr Haycock. Everyone joined in well with the music activities-see the photos below (Well done Mr Cross!) and listened to some amazing live music played by students of the Birmingham Conservatoire. Our pupils were to try out the various instruments, unfortunately, lack of time prevented this, however, Mrs Alexander- Head of the Kimichi school, has kindly offered to visit Chilcote later in the year, with a variety of instruments for the pupils to play, so we look forward to arranging this and allowing the pupils to complete their woodwind experience. Well done Year 6- we are glad you had an enjoyable afternoon. Today Collette from `Lego we play` came into Reception and helped us learn about making dinosaur models. We had a lovely time creating lego dinosaurs and homes for them to live in. Some of us created dinosaurs that we had learned about and some of us invented our own dinosaurs. We invited some of our friends from Year 1 to work with us and we enjoyed working with others and sharing our imaginative ideas. Everyone was very proud of us for working so cooperatively together and looking after all the lego pieces carefully. Thank you Collette for letting us use your fantastic collection of lego. We all had a fantastic time! On Wednesday 2nd March it was World Book Day for Chilcote Primary School. 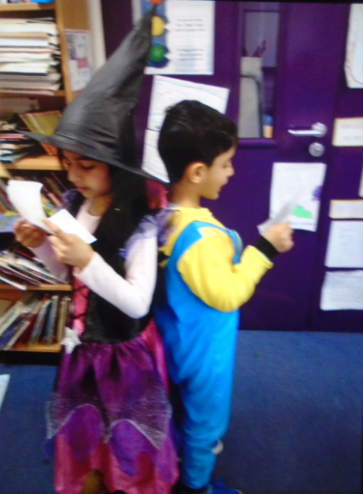 Year 2 did a fantastic job of dressing up as their favourite book characters. We had Matilda and the BFG all the way to Harry Potter and Dennis the Menace! We had a look at different people performing different poems and decided what made their performances so good. We then used this to create our own performances of the Ning Nang Nong. We tried really hard to remember the poem, to use our big loud voices and incorporate different sound effects and actions. To finish the day we shared some of our performances with Year 1 and watched their performance of 'Going On a Bear Hunt'. We really enjoyed watching Year 1 and had a fantastic day! Here are some pictures of us working hard practicing our Poems! On Thursday 3rd March Mr Haycock and Miss Norris took 5 members of the Chilcote Girls Football team to play an indoor tournament at Kings Heath Boys High school. 3 school teams competed including The Oaks and Hollywood and all teams played each other twice in three exciting 15 minute games. The Chilcote girls worked tirelessly with great teamwork to win ALL their games ending with a wonderful 6-0 win against Hollywood. Well done girls! World Book Day came to Chilcote and the year 3 staff dressed up in a Roald Dahl theme for the day. The children of year 3 dressed up in a range of different costumes and a big thank you parents, for your support with the day! Firstly, the children had a whole-school assembly with a guest speaker, Serena Arthur, who is Birmingham's Young Poet Laureate. The school council asked her some pertinent questions. The children learnt a lot from this experience and were inspired to write their own poems in the afternoon. Secondly, the children took part in a circle time where they showed each other their costumes. Then, they explained who they were and why they choose their character. Also, they explained what their favorite book was and why they liked it. Next, year 3 watched a performance of the poem 'The Owl and the Pussycat', which was brilliant! As it showed the children the importance of expression. Then Mr Fay and Miss Norris performed the poem to show how gesture, tone and humor could be used. Finally, the children swapped with year 4 and performed their poems to the children in 3 Beech. Year 4 showed us their poem 'Chocolate Cake' by Micheal Rosen, and they performed 1.1 with the students in Year 3 for a personal performance. Thank you year 4 and well done on your fantastic performance! In the afternoon the children entered into The World Book Day competition by writing a book review and other children created a shape poem in the style of the 'Owl and the Pussycat'. Wednesday was World Book Day for Chilcote. We had lots of exciting activities to participate in. The day started with us arriving in our fantastic costumes and bringing in our favourite books. We then had an assembly led by Serena Arthur, who is Birmingham’s Young Poet Laureate. She was very inspiring and shared her poems with us. Throughout the day in Nursery we practised our poems and shared our favourite books. In Reception we changed the words of the traditional nursery rhymes and talked about features of poems and rhymes. We wrote book reviews about our favourite books and shared lots of books together. We also sang lots of songs. The most exciting time of the day was when we shared what we had done with each other in nursery and reception.